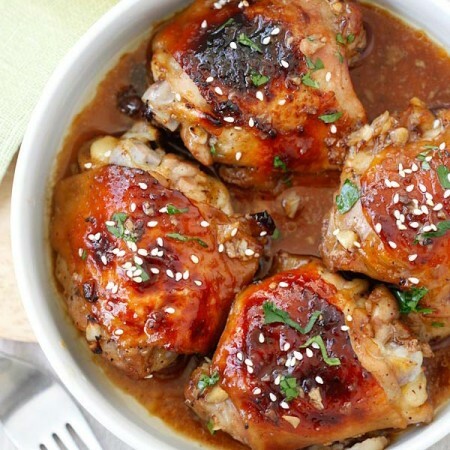 Rinse the chicken thighs and pat dry with paper towels. Add the ginger and garlic to the chicken and gently rub them on the chicken thighs. Add the rest of the ingredients to the chicken thighs, stir to coat well. Pre-heat the oven to 375F. Line the chicken on a tray lined with aluminium foil and bake for 40 minutes in the middle of the oven, or until the surface turn golden brown, slightly charred and the inside of the chicken thighs are cooked. Serve immediately. Matt Preston reveals the secret to the perfect roast chook with golden skin and juicy, perfectly cooked white meat. For me, the pinnacle of cooking isn’t found in the best restaurants of the world. It isn’t in the pretty doodlings of a chef with an overdeveloped sense of his own importance. It isn’t on a plate strewn with bitter herbs and unpronounceable ingredients that took a tribe or clan to find. It is roast chicken. The perfect roast chicken is golden of skin and has white breast meat that seems to almost weep when you slice it as it is so juicy, so perfectly cooked. The meat of the legs pulls away when you bite into it like you are sitting at some baronial table with wolfhounds at your feet bellowing for more wine. Then the humble chook becomes something noble; something to write home about in overexcited capitals scrawled high on the paper like some Hollywood art department’s idea of a ransom note: “Dear Mum, I am held hostage by a roast chicken. It will not let me go until I have sucked the flesh from its bones and sopped up its juices by pressing crunchy bronzed roast potatoes into that schmaltz-ladened stick goodness. Love Son”. 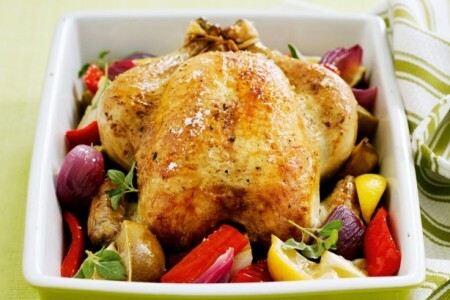 12 secrets to perfect roast chicken Choose the best chicken. A delicious smaller bird with loads of soul that’s been well fed and well treated will taste better than some Frankenstein bird. Make sure you bring the chicken up to room temperature before cooking. Preheat the oven. Make sure that the oven rack is at the right level in the oven for the bird. In other words, so the bird can fit! Note that the stuffing should taste as delicious before it goes into the bird as it does when it comes out. Use real breadcrumbs for your stuffing. I like roughly blitzing any leftover sourdough and keeping the resulting crumbs in the freezer. Make the stuffing the night before. Don’t refrigerate it, but keep in a cool place. If you do need to refrigerate, bring it up to room temperature before using, like the bird itself. Clean out and dry the cavity of the bird before stuffing, but remember there is nothing in the chook rule book that says you can’t bake the stuffing separately to the bird and just fill the cavity with some herb stems and a lemon. Always turn your wings so the tips are under the bird. This will help the breast cook more evenly. Roast your bird on a trivet or a low rack set in a low-sided baking tray. This will help the bird cook evenly. Test the bird with the thermometer and take it out of the oven when the legs reach 68C. You will also know it’s cooked when the juices run clear or the meat is just starting to edge away from the bone at the knuckle end. Rest the meat to allow the juiciness to seep its way back throughout the meat. Rest the bird breast-side down to encourage juices into the breast meat.